The PAEC initiative will foster the expansion of electric vehicles (EVs) by implementing smart designs, plans, and strategies for Electric Vehicle Charging Infrastructure (EVCI). Deploying EVCI will provide environmental benefits to the region’s communities while facilitating the adoption of EVs for residents who are interested in them. In Palo Alto, to encourage the rapid expansion of EVCI, the City of Palo Alto Utilities offers generous rebates to nonprofits, schools, and multifamily complexes to install charging stations. 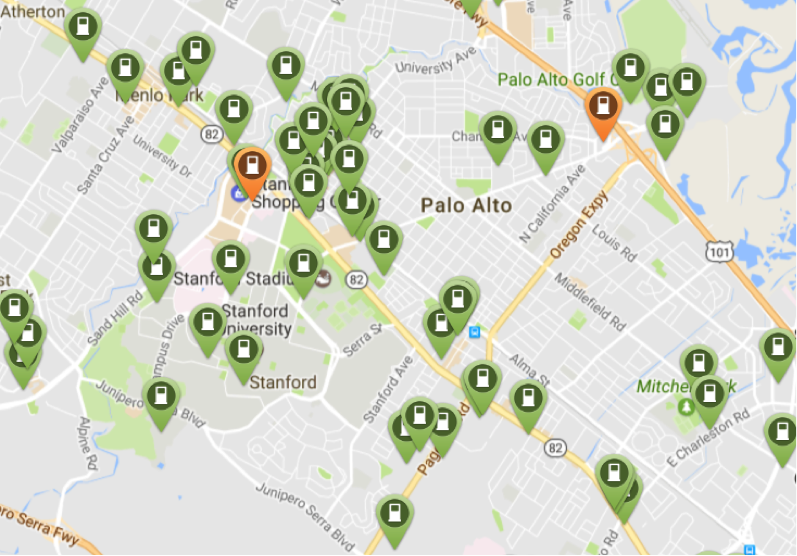 Palo Alto already has more EV charging stations than most comparably sized cities; however, the anticipated growth of EVs means many more will be required in the near future. The city currently owns and operates 40 charging ports, and it plans to double that number. Along with potential location evaluations, the PAEC team evaluated the cost-effectiveness to EV drivers of the various types of EVCI that offer the best value in terms of economic, environmental, and technical performance. The team performed an economic analysis of EVCI in both existing and new single-family dwellings and multifamily dwellings, in relationship to the typical EV user in San Mateo County.